Delhi vs Mumbai debates are incomplete without the ‘hamare paas behtar khana hai’ line being dropped. Sure, we don’t have the paranthas, nor do we have Jama Masjid ke kebab. But what we do have now is a Mumbai outpost of Delhi’s popular Asian eatery Mamagoto. Located on Hill Road, right where Nature’s Basket used to be (don’t panic, the basket has only moved a few buildings away), Mamagoto’s yellow doors welcome you into a funky space with a kitschy industrial vibe. Felines on glass windows (shuttered down when we went there because the restaurant wasn’t open to public) which promise to look funkier when you see the peak hour traffic through em, and the red and white figurines that hang between tables and the red couches create a pretty funky setting. 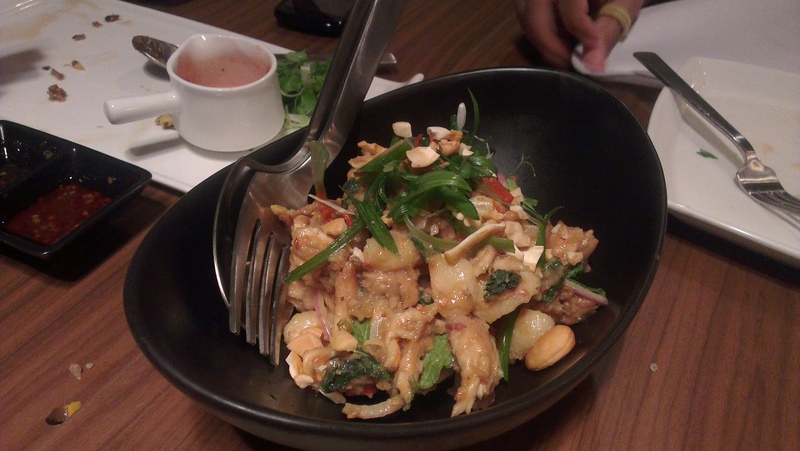 Too much of yummy stuff that went on a trip into boiling oil, meant that our guilt levels were quite high, and to make up for it, we decided to get a Thai chicken and water chestnut salad as well as the Krabi style glass noodle salad with shrimp (greed is good!). The chicken salad was aromatic, but the dressing was too sweet and too herby for my taste and I focused my attention on the shrimp salad, which packed in flavour and balance into the palate, however, the prawns were a bit on the not-so-fresh side. The one reason why I’ll come back, is that Mamagoto has a lot of healthy options, and you don’t feel deprived if you’re on a diet. But this meal wasn’t about being healthy, so next came the spare ribs. Now the ribs impressed me at first bite, the glaze is just absolutely delicious, but the meat was a bit tough so we decided to move on. Next came the much talked about bowl of Chiang Mai Train Station noodles with their creamy, sweet and spicy coconut sauce and ample veggies. This is what comfort food is (would be so much fun to enjoy this dish on a rainy Mumbai night) and it is a meal by itself. Now, ordering dessert took the most time! While they do have a mocha cheesecake, the fact that it wasn’t baked, was a dealbreaker for me, but the girls wanted some cheesecake and so, it came. On behalf of the mousse cheesecakes of the world, the Mocha Cheesecake at Mamagoto wooed me and how! 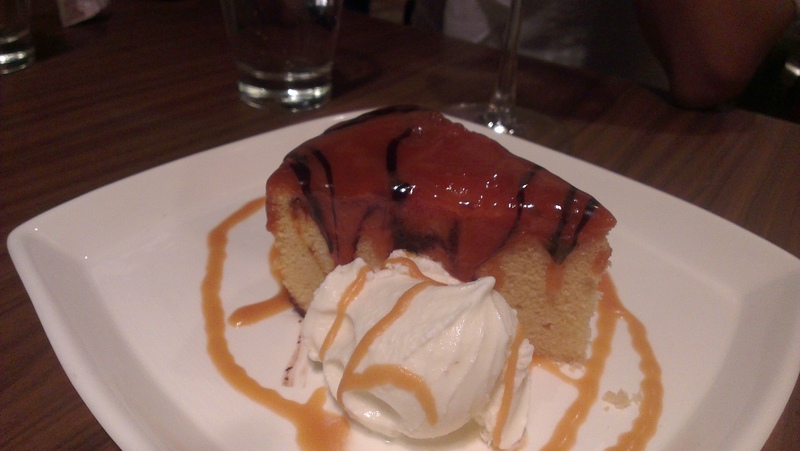 Their desserts are absolutely delish and do NOT, I repeat DO NOT leave the premises without having the Caramel sponge cake with toffee sauce. The soft, soft sponge, with a rich, velvety toffee sauce is simply out of this world and has made it to the top of my list of happy foods! Verdict: Mamagoto is a funky dining experience, with a varied menu and pretty quirky cocktails. I’ll definitely go back for another evening with friends. What I love: Lots of healthy options. Varied dishes to choose from – salads, grills, noodle bowls, appetisers. And of course: desserts to die for! What I don’t like: The service is rather confused and slow. For an Asian eatery that derives its name from the Japanese language, no sushi on the menu is slightly disappointing. Pranali’s verdict: Mamagoto is the perfect place to chill with friends when a noisy club/pub/bar is not your scene. Conveniently located, relaxed ambience and food that stays true to its origin (flavour and ingredient wise)- a perfect night out venue! Priyanka’s verdict: Impressive Crouching Tiger Hidden Dragonish interiors. Tasty basil mushroom cup starters. Glass noodle salad, spring rolls heavy on lemon grass, seafood not fresh… Dragon that doesn’t spew much fire with its food.